Migration: a future to be constructed. Aubrey Williams’s art inevitably brings us to question migration which is often termed by historians and art critics as mobility, fragmentation or dispersion. Williams is one of the Caribbean artists who had to migrate to Europe in the 50s and most of his work was created in London. He is often described as an expatriate and outsider, or the artist who resists classification. That is why it seems worthwhile to study the impact of migration on his work. 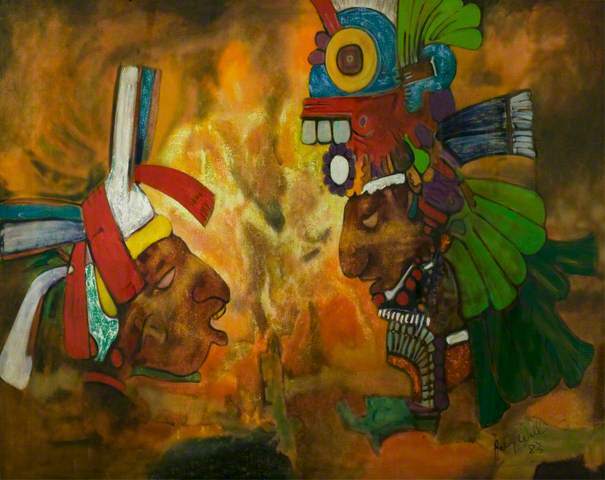 In her book Caribbean Art[i], Veerle Poupeye describes his work as belonging to Lyrical abstraction, ‘prevalent in the Caribbean and (…) often based on the landscape and flora, which serve as vehicles for emotional associations.’ Paintings like the 1982 series Maya Confrontation exemplify his use of Amerindian culture and symbols, inspired by his interest in the warrau culture, the background evoking the Guyanese rain forest. His large paintings are influenced by abstract expressionist artists such as Arshile Gorky, Jackson Pollock and Mark Rothko. Many of us think about Pollock’s painting, Moon Woman Cuts the Circle (1943) inspired from Native American legends. At the same time, states art critic Reyahn King[iii], he considered that the Olmec and Mayan civilizations, in particular, could and should be meaningful and an inspiration for everyone, regardless of background. Williams understood that the destruction that took place in the Americas of the past and what happens now in South American forests has global relevance. Today, when our newspapers inform us about the interconnected environmental state of our world, we may more easily appreciate Williams’ timeless vision. Like other critics and art historians Veerle Poupeye attempts to classify the overlooked Guyanese artist who, unlike Bernadette Persaud avoided political implications in his work, preferring to express emotions and mystery. The challenge was also, for the Caribbean artists living in the archipelago to move from traditional painting, from landscapes and portraits, to modern art. Most of them express the need in the 80s to work on different subjects in a less figurative style, expressing thus the evolution of the art world. This can be felt in Williams’s later work too, more specifically in the large paintings. Bright colours prevail, evoking the light and sun which illustrate the artist’s nostalgia for the landscapes of his native land. This also brings a reflection about the following generation of Caribbean artists working in the UK, such as Sonya Boyce and Keith Piper and Eddie Chambers, who, as Black British artists made the choice of a more confrontational style of work to express their feeling about identity and belonging, or what sociologists have designated as ‘appartenance’. Williams is appropriately described as a visionary and there is no doubt that he would have felt very much aware of the experience of the Black artists in the UK, of their choices of subjects and contemporary practices. The light boxes in Piper’s work and the photographic juxtapositions of Sonya Boyce associated with their own histories and commitments conjure Williams’s thoughts and misgivings concerning his personal experience as an expatriate. Today, Aubrey William’s work is widely represented in art exhibitions in Europe and elsewhere. Some of his paintings can be seen in Georgetown Museum in Guyana. A retrospective in 1998 in Whitechapel Gallery, then A Study Day at Tate Britain in 2007, exhibitions in Liverpool and London in 2010, and then a symposium on his work at Cambridge University in April 2014, many events commemorate the very creative life of a great Caribbean artist paving the way for future generations. Aubrey Williams’ work was displayed within Tate Britain’s recent exhibition ‘Artist and Empire’, which from on 25th of November 2015. 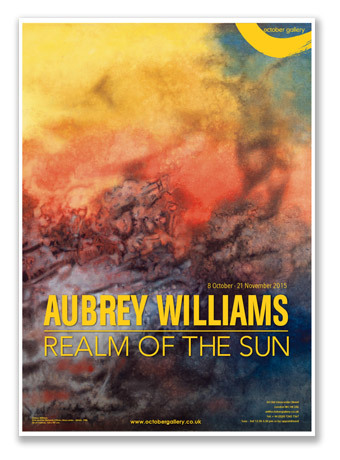 The Symposium Aubrey Williams Now has taken place in the October Gallery Theatre* in November 2015 along with the exhibition Realm of the Sun. All this should provide answers about Williams’s representation in the artistic world and his artistic influence. Was it right to position the man who from the Caribbean Artist Movement founded in 1966 within a British art tradition? Let us hear once more the great literary voices such as Derek Walcott, E. Kamau Brathwaite, or Edouard Glissant, and ponder about the singular global experience which clarifies the challenges at stake for the Caribbean artist, in Aubrey Williams’s times or today. *Founded in 1979, October Gallery, in central London, exhibits innovative, contemporary art from around the world. For over 35 years, October Gallery has pioneered the development of the Transvangarde – the trans-cultural avant-garde. This gallery has played an important role in encouraging and exhibiting works by artists from the Diaspora and it has exhibited Aubrey Williams’s creations many times, thus helping in keeping his work in the public eye. Other artists from the ‘periphery’ such as El Anatsui have been exhibited once or twice. [i] Caribbean Art, Veerle Poupeye, 1998, Thames and Hudson Ltd, London. [ii] Aubrey Williams, edited by Reyahn King, 2010. [iv] Stuart Hall, Negotiating Caribbean Identities: This text was given as the 1993 Walter Rodney Memorial Lecture, at the kind invitation of Professor Alastair Hennessy, Centre for Caribbean Studies, University of Warwick.